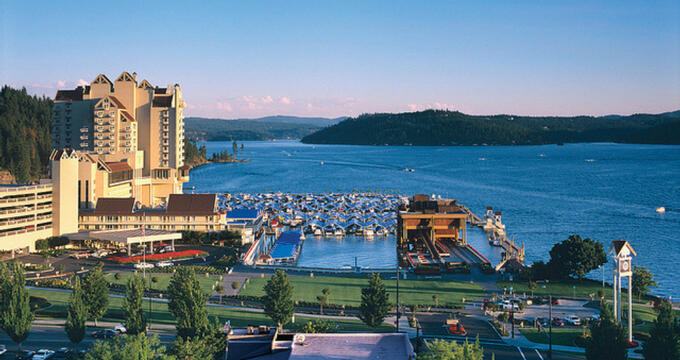 The Coeur d’Alene Resort, in Coeur d’Alene, Idaho, sits on the edge of the lake with the same name. The resort features luxury accommodations, a full-service spa, a renowned golf course, and multiple award-winning dining experiences - all without having to leave the resort grounds. The accommodations at the resort are either in the 17 stories Lake Tower or the smaller Park Tower. Both the Lake Tower and the Park Tower have guest rooms with lake views (available from the 1st to the 7th floor), and guests can upgrade to a room with a fireplace (available from the 8th to the 17th floor). Each room has its private balcony that overlooks the lake, and large, floor to ceiling picture windows (with curtains that can be controlled by remote control). The fireplaces are gas powered. The bathrooms have a separate dressing room, granite sinks, and a separate bathtub and shower. Resort guests can choose between a king size bed or two double beds. There are two suites available at the resort as well. The Hagadone Suite is located on the Lake Tower’s 18th floor and is 2500 square feet in size. The suite features a separate bedroom (with a king size bed), living area (with fireplace) and dining room (which can seat up to six people at a time). The bathroom has a waterfall style bathtub with an in-mirror television. The suite has cathedral ceilings and two balconies (one of which features a jacuzzi hot tub as well as a glass bottomed swimming pool). This suite can be connected to another suite (the Middle suite). The other suite at the resort is the Jaeger Suite. It is 1500 square feet in size and also has a separate bedroom (with a king size bed as well), bathroom (with an in-mirror television), and two balconies. The living area has a gas fireplace. It is also on the 18th floor and can be connected to another suite (the Middle suite) as well. Each bed has been fit with luxury bed linens and pillowtop mattress. Each room and suite have complimentary wireless internet access. There are coffee makers for hot coffee or tea, mini fridges (stocked with premium spirits, candy, and beer), and guests will have a daily local newspaper is delivered to the front door every morning. The bathrooms are all outfitted with top of the line toiletries and cotton robes. The Coeur d’Alene Resort has different dining packages for resort guests. All packages are based on resort availability and must be reserved ahead of time. The packages include room service and gift certificates to either an on-site or off-site restaurant. One of these restaurants is Beverly’s. Beverly’s is regularly ranked as one of the top restaurants in the United States and is located on the 7th floor of the resort. It offers five-star cuisine with Northwestern flavors and the most extensive wine seller in the Pacific Northwest (with more than 14000 bottles). Another restaurant located at the resort is Dockside. Dockside offers resort guests classic dishes, a large (18 foot) salad bar, Sunday brunch, and signature desserts. It is located on the lobby level, at the water’s edge of the resort and lake. An additional option is the Cedars, a floating restaurant. It is located on Blackwell Island in the middle of the lake. Guests can enjoy fresh salmon, a prime rib, and salad. Resort guests who are interested in just grabbing a cup of coffee can visit the Lobby Cafe, located on the main floor. The cafe offers espresso drinks, drip coffee, and pastries created by the resort’s pastry chefs. The resort also has its own, in house spa. The spa focuses on treatments mostly using the four elements, especially focusing on water and stone treatments. It has been rated as one of the top spas in the entire United States for multiple years in a row, as well as one of the most romantic due to the focus on couple’s massage. They also offer spray tanning, seasonal spa services, and discounts for bridal groups. There is also a full-service golf course for resort guests. The golf course has been featured in multiple golf publications like Golf Digest and is 18 holes with a par 71. It is just under 7000 yards in length. The course also has a caddie program and also golf lessons for an additional fee. Luxury golf carts are also available. The course was designed by Scott Miller.